«There's no secret formula in making bad movies. You just need a muscle man like myself and very big budget. Oh yeah ! 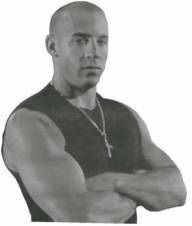 You gotta be stupid,» announced Vin Diesel on the Break two Legs festival after consuming 200 steroids. Some time later he made another very intelligent announcement : «I love chicken and hairy girls! Hair and big feet are my obsession, and my hobby. I just love it. When I see a hairy girl, I gotta have her and take her out.» So then I asked him what was his taking out concept.